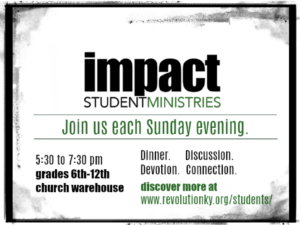 Revolution Youth is for students grades 6-12 to help them experience God’s revolution in their lives. Each year the youth participates in missions such as 4th Avenue lunch service in Louisville, various retreats, scouting and other fun events that build spiritual maturity! Youth meets weekly beginning September 16th from 5:30 – 7:30pm each Sunday evening. Meetings are located in the church cafe and warehouse. We always have at least 2 people on staff to connect with, worship with, and teach the students. Dinner is served at each gathering and then followed by games and Bible lesson.